In 1977, four teenagers and a dog—Andy (the tomboy), Nate (the nerd), Kerri (the bookworm), Peter (the jock), and Tim (the Weimaraner)—solved the mystery ofSleepy Lake. The trail of an amphibian monster terrorizing the quiet town of Blyton Hills leads the gang to spend a night in Deboën Mansion and apprehend a familiar culprit: a bitter old man in a mask. Now, in 1990, the twenty-something former teen detectives are lost souls. Plagued by night terrors and Peter's tragic death, the three survivors have been running from their demons. When the man they apprehended all those years ago makes parole, Andy tracks him down to confirm what she’s always known—they got the wrong guy. Now she'll need to get the gang back together and return to Blyton Hills to find out what really happened in 1977, and this time, she's sure they're not looking for another man in a mask. 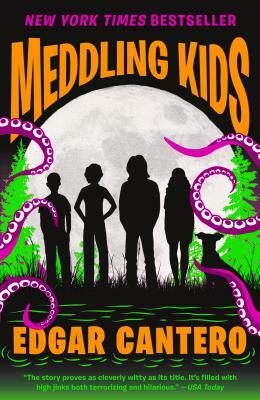 A mad scientist's concoction of H. P. Lovecraft, teen detectives, and a love of Americana, Edgar Cantero's Meddling Kids is a story filled with rich horror, thrilling twists, outright hilarity, and surprising poignancy. Edgar Cantero is a writer and cartoonist born in Barcelona in 1981. Meddling Kids is his second novel in English; his first was The Supernatural Enhancements. "An adventure that meshes Lovecraft-like elements with an eco-catastrophe thriller, providing chills and chuckles in equal measure."